Home » VANDERBILT, ALFRED G.
ALFRED G. VANDERBILT (1912-1999) Son of Alfred G. Vanderbilt who died in the Lusitania. Horse racing enthusiast. Famous for his legendary horse Native Dancer and arranging the epic 1938 Pimlico Special match race between Seabiscuit and War Admiral, at his Pimlico Race Course. Headed the New York Racing Association and United States Jockey Club. These war bonds were issued to finance "the payment of bonuses to honorably discharged Soldiers, Sailors and Marines of the World War, who were actual residents of the State at the time of their enlistment..."
1933, New York. Brown/Black. Vignette of state seal at upper center. Loan for Canal Improvement, $10,000 bond bearing 4% interest. Signed by Alfred G. Vanderbilt on the attached stock irrevocable power. Alfred G. Vanderbilt (1912-1999) Son of Alfred G. Vanderbilt who died in the Lusitania. Horse racing enthusiast.The bond is stamp and punch cancelled, the stock power is uncancelled. Fine. 1937, New York. 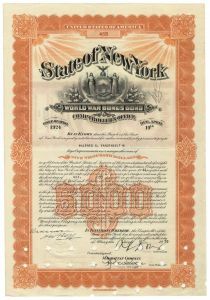 Beautifully engraved Bond Certificate New York Emergency Unemployment Relief Bond issued by the State of New York for $1,000. Ornate border around it with a vignette of two women on both sides of the shield of New York. Below the vignette is the word : Excelsior. Violet/Black ALFRED G. VANDERBILT (1912-1999) Son of Alfred G. Vanderbilt who died in the Lusitania. Horse racing enthusiast. Famous for his legendary horse Native Dancer and arranging the epic 1938 Pimlico Special match race between Seabiscuit and War Admiral, at his Pimlico Race Course. Headed the New York Racing Association and United States Jockey Club. Punch cancellations. Very Fine. 1933, New York. $5,000 World War Bonus Bond bearing 4 1/4% interest. Orange/Black. Engraved vignette of the state seal. Issued to ALFRED G. VANDERBILT (1912-1999) Son of Alfred G. Vanderbilt who died in the Lusitania. Horse racing enthusiast. Famous for his legendary horse Native Dancer and arranging the epic 1938 Pimlico Special match race between Seabiscuit and War Admiral, at his Pimlico Race Course. Headed the New York Racing Association and United States Jockey Club. These war bonds were issued to finance "the payment of bonuses to honorably discharged Soldiers, Sailors and Marines of the World War, who were actual residents of the State at the time of their enlistment..." . Punch cancellations. Very Fine. 1935, New York. Blue/Black. 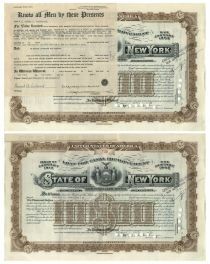 $5000 bond bearing 3% interest issued to Alfred G. Vanderbilt, but not signed by him. Small vignette of allegorical figures at top center. Perferation and stamp cancelled. Fine. 1937, New York. $1,000 engraved Bond for “General State Improvements” bearing 4% interest. Green/Black. Vignette of NY State Seal, Liberty & Justice at top. Issued to: ALFRED G. VANDERBILT (1912-1999) Son of Alfred G. Vanderbilt who died in the Lusitania. Horse racing enthusiast. Famous for his legendary horse Native Dancer and arranging the epic 1938 Pimlico Special match race between Seabiscuit and War Admiral, at his Pimlico Race Course. Headed the New York Racing Association and United States Jockey Club. Punch cancellations. Very Fine. 1935, New York. $5,000 State Bond Railroad Grade Crossings bearing 3% interest. Blue/Black. Engraved vignette of the state seal at top center. Issued to: ALFRED G. VANDERBILT (1912-1999) Son of Alfred G. Vanderbilt who died in the Lusitania. Horse racing enthusiast. Famous for his legendary horse Native Dancer and arranging the epic 1938 Pimlico Special match race between Seabiscuit and War Admiral, at his Pimlico Race Course. Headed the New York Racing Association and United States Jockey Club. Punch cancellations. Very Fine. 1935, New York. $10,000 State Bond Railroad Grade Crossings bearing 2 ¾% interest. Blue/Black. Engraved vignette of the state seal at top center. Issued to: ALFRED G. VANDERBILT (1912-1999) Son of Alfred G. Vanderbilt who died in the Lusitania. Horse racing enthusiast. Famous for his legendary horse Native Dancer and arranging the epic 1938 Pimlico Special match race between Seabiscuit and War Admiral, at his Pimlico Race Course. Headed the New York Racing Association and United States Jockey Club. Punch cancellations. Very Fine. 1933, New York. $1,000 State Bond Railroad Grade Crossings bearing 3% interest. Blue/Black. Engraved vignette of the state seal at top center. Issued to: ALFRED G. VANDERBILT (1912-1999) Son of Alfred G. Vanderbilt who died in the Lusitania. Horse racing enthusiast. Famous for his legendary horse Native Dancer and arranging the epic 1938 Pimlico Special match race between Seabiscuit and War Admiral, at his Pimlico Race Course. Headed the New York Racing Association and United States Jockey Club. Punch cancellations. Very Fine.